What Is Mint and How Is It Used? Mint has long added its bright flavor and scent to drinks and dishes, especially in Balkan and Middle Eastern cuisines. The fresh or dried leaves are an ingredient, while the essential oil is extracted as a flavoring and scent. The young leaves are continuously harvested from spring through fall, but mint can also be grown indoors and so is available year-round. Mint is used in a variety of delicious baked treats, savory sauces, and drinks, from hot mint tea to cool mint juleps and mojitos. Mint is an aromatic herb produced by various species of the mint plant (Mentha). Native to the eastern Mediterranean, mint gets its name from a mythic nymph named Minthe (Mintho). Jealous Persephone turned her into a lowly mint plant after she had an affair with Pluto, god of the underworld. The mint plant is common and a favorite of many gardeners, so it's easy to grow your own. As an herb, it is gluten-free and suitable for vegan, vegetarian, and paleo diets. Spearmint and curly mint are the varieties most often grown to use as an herb in cooking and beverages. Peppermint is a little too strong to use fresh for most culinary purposes. Instead, it is grown and processed into peppermint oil, which is then used as a flavoring, and it can be further refined into menthol. You can find other varieties of mint that have interesting flavors and aromas. Apple mint has an apple scent; orange mint has a citrus flavor; chocolate mint has a bit of chocolate taste. Mint tastes sweet and produces a lingering cool effect on the tongue. 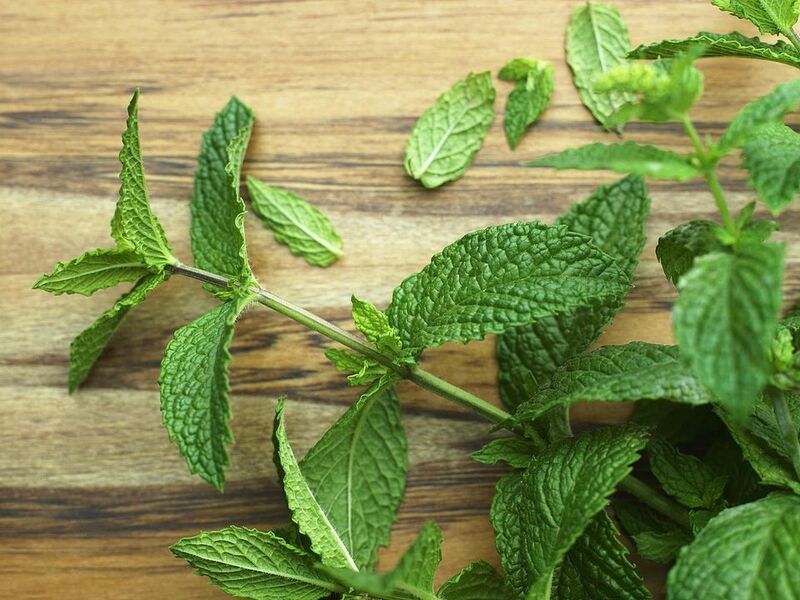 Peppermint has a stronger flavor with more menthol taste. The fresh leaves have the most flavor and scent, with those much reduced in dried mint leaves. Fresh mint leaves are usually cut in ribbons (chiffonade) and added to recipes. A stalk with a few tender leaves is placed in a hot or cold beverage and may be crushed (muddled) to release more flavor. Dried mint leaves can be added to a sauce or stew as it simmers. Mint extract is used to give mint flavor baked goods or confections, or to flavor hot chocolate. Mint traditionally complements lamb and poultry. It is widely used in Middle Eastern and Greek dishes, including salads, side dishes, and sauces. Fresh mint is a favorite for herbal tea. In the home, mint has long been used as an aromatic. As a strewing herb, it was scattered around the house as a deodorizer. Today, it is commonly used in sachets and potpourris. Some soap makers add small amounts of dried mint to their soaps, while peppermint oil is sometimes used in aromatherapy to improve alertness. Fresh mint can be found in the produce section of the supermarket, next to other fresh herbs. Dried mint is sold in the spice section. Look for spearmint and peppermint extract in the baking section. Mint plants are very easy to grow. The plants enjoy a damp soil and most tolerate a bit of shade. Most mints are perennials. When planted in a good location, the herb will return year after year. In fact, many gardeners find that mint is so easy to grow that they can't get rid of it when they want to. It does like to spread when it finds a good spot, so plan accordingly. You can dry fresh mint, whether from your garden or bought in bunches at a farmers market. Simply cut long sprigs of mint, tie them into bundles, and hang them upside down. Once dry, remove the leaves and store them in a glass jar or sealed plastic bag. This allows you to enjoy your mint year-round. Store fresh mint in the refrigerator or place the stems in a container of water and cover the leaves with loosely with a plastic bag. Dried mint should be stored in a cool, dark place in a sealed jar. Each variety of mint has been traditionally used to treat numerous ailments, ranging from an upset stomach to nervousness. Modern medical research has focused on peppermint oil, which is now often sold as a dietary supplement capsule, medicinal tea, or topical preparation. The National Center for Complementary and Integrative Health (NCCIH) of the National Institutes of Health notes that peppermint oil may be of use for symptoms of irritable bowel syndrome (IBS) when taken in enteric-coated capsules. In combination with caraway oil, it may help indigestion. Topical peppermint oil has some limited evidence of being helpful for tension headaches. There isn't enough evidence to show peppermint oil or peppermint leaf is useful for any other conditions. The usual doses of peppermint oil capsules should be safe, but it can be toxic in excessive doses. Peppermint oil should not be applied to children or infants as it can cause serious respiratory side effects. It can also result in rashes and skin irritation for adults as well.